I had the best day on Saturday. Where did I go? Nowhere! What did I do? Nothing! When was the last time you said you had the best time doing nothing? I know! Sometimes I feel like my life is like a runaway train. And although I enjoy its active pace, I wish I took more time to sloooooow down. This past Saturday was going to be more of the same — squeezing in a workout, a big farmer’s market shop for my classes, watching Mr. Picky’s soccer and baseball games, and chauffeurring the girls here and there. But the universe gave me a big gift in the form of a torrential rain storm and everything was canceled. Thank you, thank you! Mr. Picky stayed in his pajamas until 1:00 in the afternoon. I read more of the newspaper than just the front page. Daughter #1 and her adorable friend who spent the night would have normally met friends in town for breakfast, but hung around with us instead. They played as much One Direction music as we could take, baked a cake, and photographed every move for their 2,000 Facebook “friends” to enjoy. One thing for sure, I knew I would be making soup. 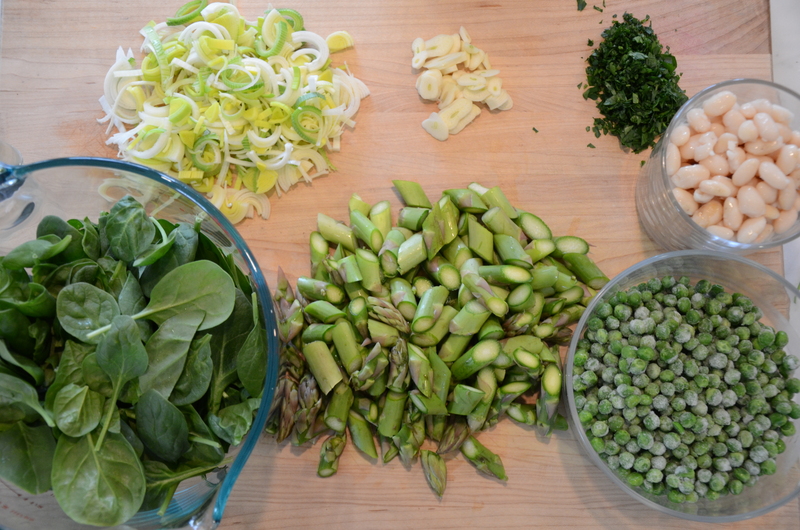 I had an extra bunch of asparagus from Friday’s class, white beans and peas in the freezer, and a small bag of spinach. I had the makings of one of my favorites, Spring Green Minestrone. This is the soup I make whenever Spring rolls around. As much as I love hearty, chunky soups and stews, I like to leave those to the winter. Lighter, fresher soups appeal to me now, but ones which still have the ability to warm me up. And the combination of white beans and peas amounts to a complete protein, so I feel satisfied enough to eat this as a meal. But it’s all that GREEN that really makes me feel nourished. The ingredients in this soup look like they couldn’t amount to anything special — there’s no secret ingredient, no flavor boosters. I’m even surprised when it turns out delicious. And the recipe is so dead simple, you have no excuse NOT to make your vegetable stock from scratch. This soup was one of the first cooked vegetable dishes that Mr. Picky actually ate a normal portion of. Saturday was no different. He dropped a piece of sourdough toast in his soup and ate every last pea. My husband poured the usual Pecorino in his. 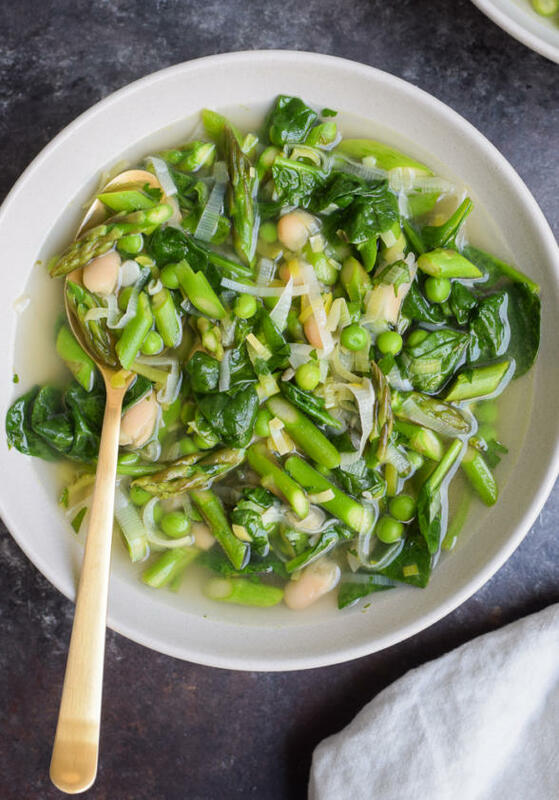 As for me, I embraced my bowl of springtime au naturel — perfect in its simplicity and which I ate really slooowly. I needed to make this special day last. Because although I heard it would rain again on Sunday, I knew that the chances of that happening were about as good as my kids getting a Coke with their lunch. And sure enough, Sunday’s sunshine came with places to be and things to do, but I got back on the train rejuvenated and restored and ready for it all. In a large pot, heat the olive oil over medium heat. Add the leeks and sauté until tender, about 5 minutes. Add the garlic and sauté another 2 minutes. Add the asparagus, peas and parsley and toss to coat with the oil, leeks and garlic. Pour in the stock, white beans, and sea salt. Bring to a boil and lower the heat to a simmer. Cook uncovered until the asparagus is just tender, about 5 minutes. Stir in the spinach leaves and taste for seasoning. Don't be disappointed, but that's all you have to do! If you make your own stock, use the tops of your leeks and the woody ends from the asparagus that you might be inclined to compost or throw away. No problem! There’s always a good substitute for everything. 🙂 I would try green beans (even frozen is great), small cauliflower florets or fennel. I made this tonight with grilled cheese for my family and it was perfect for this cold night. It was deeeelicious!! I can’t wait to have it for lunch tomorrow. I have never cooked with leeks before so it was also nice to eat and cook with something that was new to me. Thanks again! Hi Pamela! This looks delicious! My husband is allergic to leeks. 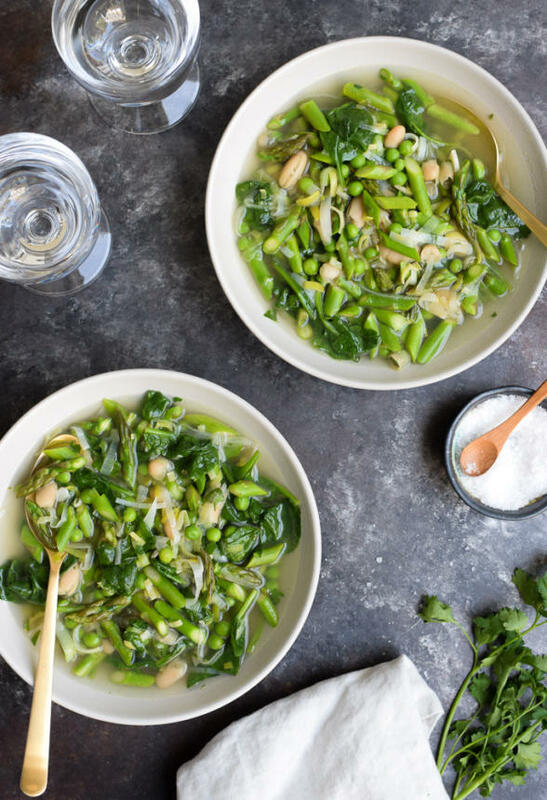 Would you suggest substituting leeks for something else? Thanks so much! I eat so much of it that the soup alone was my dinner yesterday. Do you think it can freeze well? I am afraid it will lose its wonderful fresh feeling. I have never frozen this soup, so I can’t say how it would hold up. But think your instinct is probably correct — it would not likely keep the same freshness and I think the asparagus would become mushy. Love your vegetable combination! 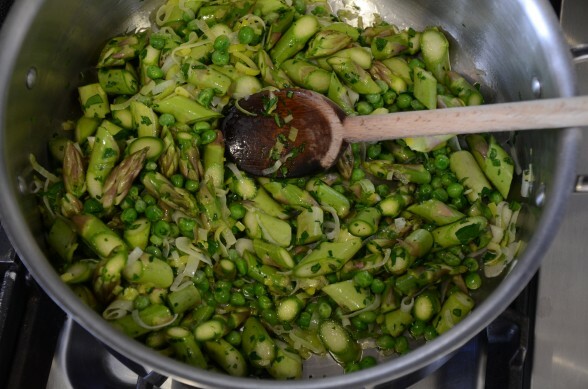 In fact, I have made the same spring vegetable saute without the broth to accompany grilled chicken or fish. I saute each vegetable and at the end simmer all of them with some white wine. Before serving I sprinkle chopped basil or parsley or chives or even mint or dill (or a combination)over all. Can’t wait to try the minestrone. Many thanks! Thank you, Mia! You know, the same thought occurred to me when I was photographing the vegetables before adding the stock. I’m sure it’s delicious and easy to boot. appears to be very easy to make, will try soon! Thank you, AK. Beyond easy to make. You’ll love it. Hi Pamela, have been away with Matt in Florida and haven’t been on your site for awhile. This really looks so good and especially now since this is a perfect lent recipe before our Greek Easter. Can’t wait to try it!